InLoox PM Web App enables to create, send, and follow up project-oriented offers and invoices. Also, ongoing Billing is possible based on project time tracking. Automatic billing numeration avoids forgetting any expenses or charging them twice. Open an existing project with the budget. In the project, on the Start tab, in the Sections group, click Budgets. 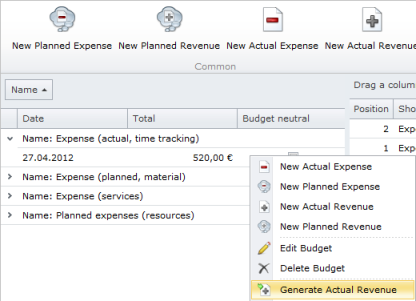 Choose a budget from the budget list, to which you want to generate a bill (actual revenue). On the Edit tab, in the Actions group click Generate Actual Revenue. The actual revenue is generated together with the positions of the budget document you have chosen. Issue a report to each budget document and send it as a document via email. On the Budget page, in the budget list, choose a budget, to which you want to issue a report. In the Create group click Create Report, in the New Report dialog box, in the Report tab choose a template from the Use this template drop-down list. Filter the data you wish in the Budgets tab and then click OK. In the Reports group choose a report you want from the gallery view, e.g. Offer. In the New Report dialog box choose the output format, e.g. HTML, PDF or RTF. Click OK. Such report templates as Expenses / Revenues, Budget overview or Transaction list are included into the standard delivery. For more information on how to add new budget template to the InLoox PM Web App, see Manage report templates. How to generate an invoice in InLoox PM 7 Web App • Copyright 1999-2019 © InLoox GmbH. Tous droits réservés.